A rat rod is a style of hot rod or custom car that, in most cases, imitates (or exaggerates) the early Hot Rods of the 1940s, 1950s, and early-1960s. The style is not to be confused with the somewhat closely related “traditional” Hot Rod, which is an accurate re-creation or period-correct restoration of a Hot Rod from the same era. Most Rat Rods appear “unfinished”, regardless of their status, as only the vehicle’s bare essentials are driven. Originally, Rat Rods were a counter-reaction to the high-priced “customs” and typical Hot Rods, many of which were seldom driven and served only a decorative purpose. The Rat Rod’s inception signified a throwback to the Hot Rods of the earlier days of Hot-Rod Culture—built according to the owner’s abilities and with the intention of being driven. 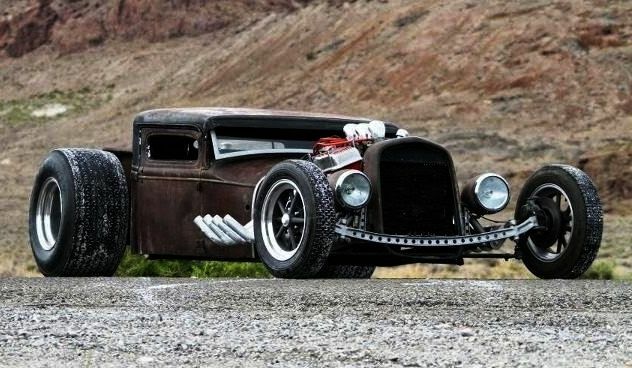 Rat Rods are meant to loosely imitate, in both form and function, the “traditional” Hot Rods of the era. Biker, greaser, rockabilly, psychobilly, and punk sub-cultures are often cited as influences that shaped rat rodding.